How many times have you shuddered at the sight of a complex set of slides that deliver too many facts and very little information? ...too often! 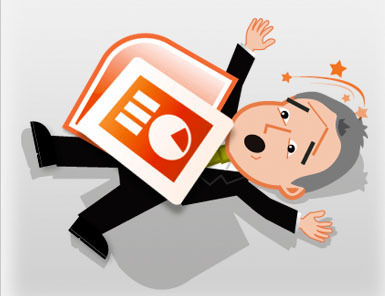 Avoid the common pitfalls, and find out how you can make PowerPoint work for you....right here! At JB we’ve had over 40 years of experience of delivering sharp, short messages that make audiences react. Our Top Tips for Presenters told you how to deliver those messages in person and with confidence and skill. Now we’ve turned our attention to PowerPoint. Our aim is simple: to show you how you can make every slide count. A bad slide deck can undermine your credibility as well as bore your audience, so it pays to get it right every time. 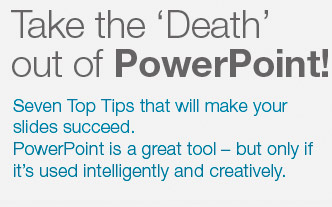 We want you to be able to use PowerPoint so that it adds value, whether you’re presenting internally or externally. Excellent slides can help you inspire your audience; bad ones make you look bad. It’s that simple. You can take a look at the tips on this site, or you can download them all as a PDF – it’s up to you.